Training a dog to use a ramp to go up a truck or car is a similar process of training a dog to use a ramp in the canine sport of agility. A time may come when you may need to train a dog to use a ramp. Dogs, although agile for most of their lives, will eventually start to slow down as they age—they tend to develop mobility problems along the way. Younger dogs may also develop orthopedic problems which can make jumping in and out of a car or truck problematic. For an old dog with arthritis, jumping in and out of a car can be a painful experience and it may also lead to further injuries such as a deep muscle bruise or a twist of a joint. Some dogs may also develop a serious orthopedic injury such as a fracture or even injuries to the spine. A ramp helps reduce strain on a dog's legs, back and hips. Many dog owners purchase ramps to help their dogs up their car or truck, only to realize that their dogs are reluctant to use them. We can't blame these dogs though: Unless a dog has been enrolled in the sport of agility, a ramp is something odd and it can be quite intimidating too. It doesn't help the fact that many dogs are naturally neophobic, in other words, they are afraid of novel things. They may be fearful to approach large objects, let alone walk on them especially when they are not level or stable enough. Many dogs are afraid of losing their footing on surfaces they are not familiar with. In order to help these dogs out, we must put ourselves a bit in their shoes (or better, their paws! ), to help them overcome this initial diffidence and encourage them to walk up and down with more confidence. 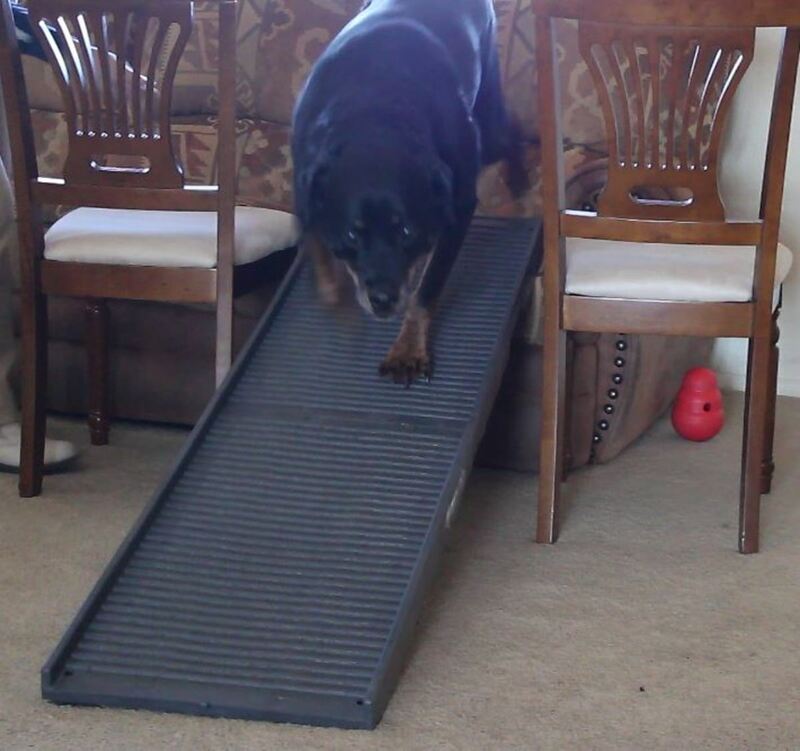 The best way to train a dog to use a ramp is to, therefore, go slow and steady, never forcing the dog up but actually, allowing the dog to explore and learn more about the ramp on his own in the first place. 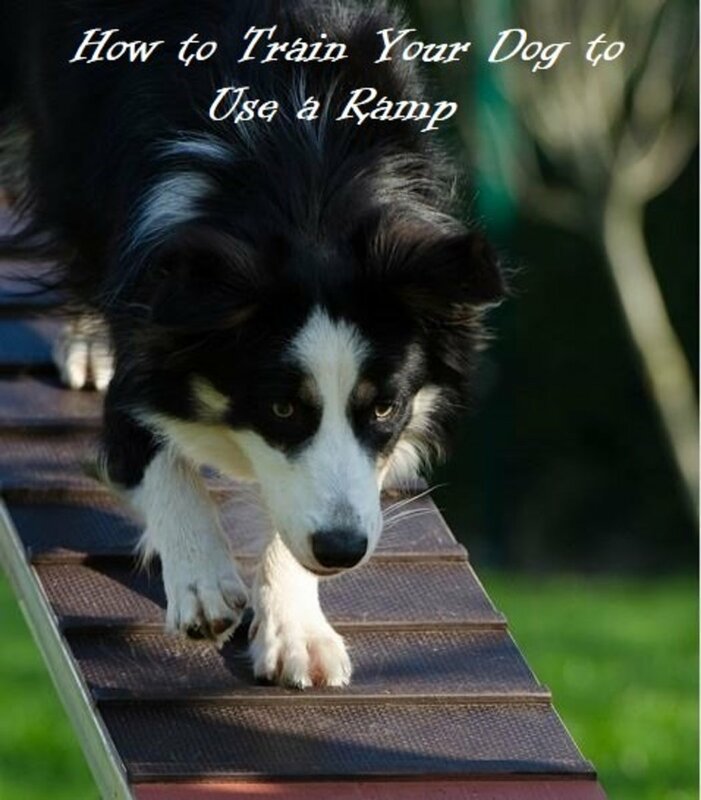 In order to train your dog to use a ramp, all you will need is (of course, patience!) 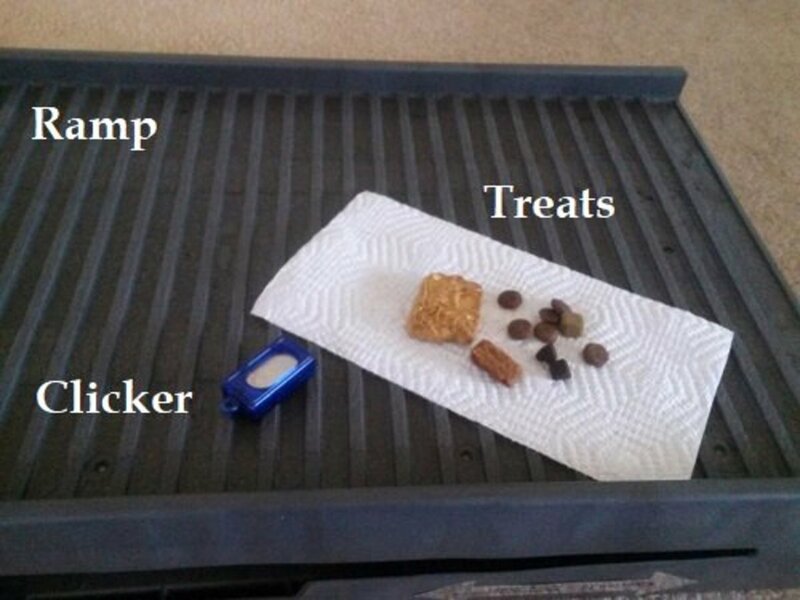 a ramp, some tasty treats, a clicker (optional), and if possible, a couch or sidewalk to practice on a slighter incline and boxes or chairs (or a helper) to prevent your dog from falling. 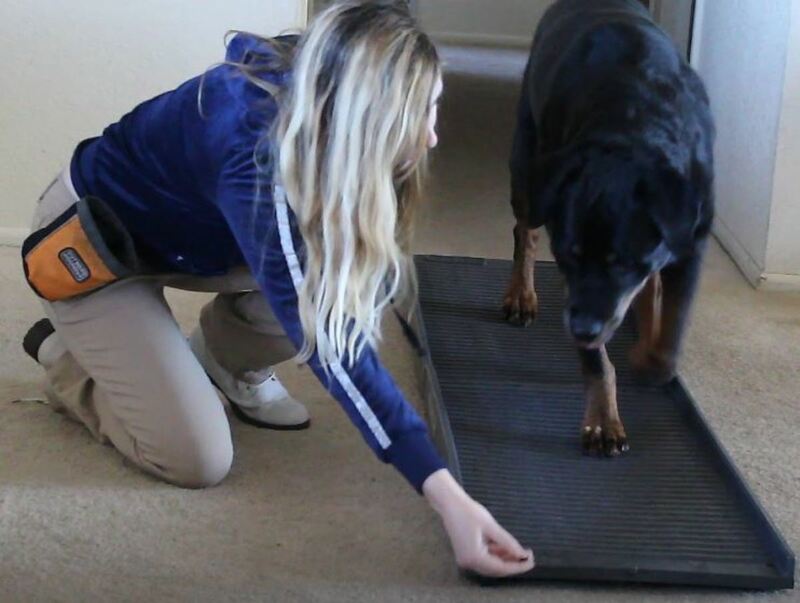 As always, a gradual approach is needed, as we want to focus on creating positive associations with the ramp while moving onto providing reinforcement for operant behaviors until the dog is perfectly comfortable going up and down the ramp on his own. So the first goal is to present the novice stimulus (in this case, the ramp) in such a way that it appears less intimidating by taking a systemic, gradual approach using small steps. Once positive associations are made and the dog is more confident and eager to approach the ramp, we can then get the dog to cognitively function at an operant level. When dogs are fearful of something, they are often over threshold, which makes it difficult for them to think straight. It is not easy for dogs in a fearful state to follow directions, and that's why it's important to get the dog to calm down by changing the underlying emotions towards a previously potentially intimidating stimulus first. With the dog in a calmer state of mind and eager to learn, it is, therefore, easier to ask for behaviors and provide reinforcement for them. With positive reinforcement, we are providing a pleasant consequence for the dog performing a desired behavior. Soon, the behavior of going on the ramp can be put on cue. You can use any word you want as long as you're not saying an extra long sentence or similar words used for other cues, and it's important that you stay consistent. 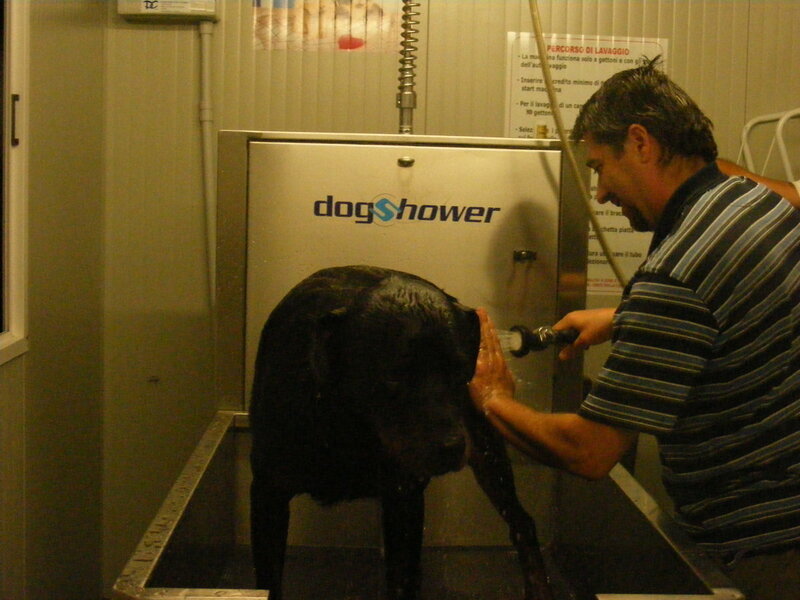 You can accompany the cue with a hand gesture that encourages your dog to go up. The dog, therefore, is not asked to climb up the ramp at once, (which may lead to a frightening experience, even in a confident dog! ), but rather climb it up one step at a time, preferably allowing the dog to proceed at his own pace. This step-by-step approach where gradual, successive approximations are rewarded is known in dog training as "shaping." We basically want to form positive associations with the ramp so that the dog is no longer reluctant to approach it, but rather is eager to approach it because it has come to represent wonderful things. The best way to form these great associations is often with the use of high-value treats. You may have to experiment to find what your dog loves and would do summersaults for. Kaiser loves cookies so a whole cookie for him is worthy of climbing up the ramp or doing any other behaviors that he may be a bit hesitant about performing. The cookies have a real impact on his motivation and retaining any new behaviors he has learned. When shaping and conditioning a dog to approach novel objects and perform new behaviors, I like to use a clicker to mark desired behaviors, but you can choose to use a verbal word such as "yes" followed by a treat. You can pick one or the other. I personally use a clicker because I love its cutting-edge precision and the fact it lacks the unpredictability of the tone of voice. OK, OK, I also love to use it because I attended several workshops by some awesome trainers some years back and fell in love with this method and the results it reliably gives. 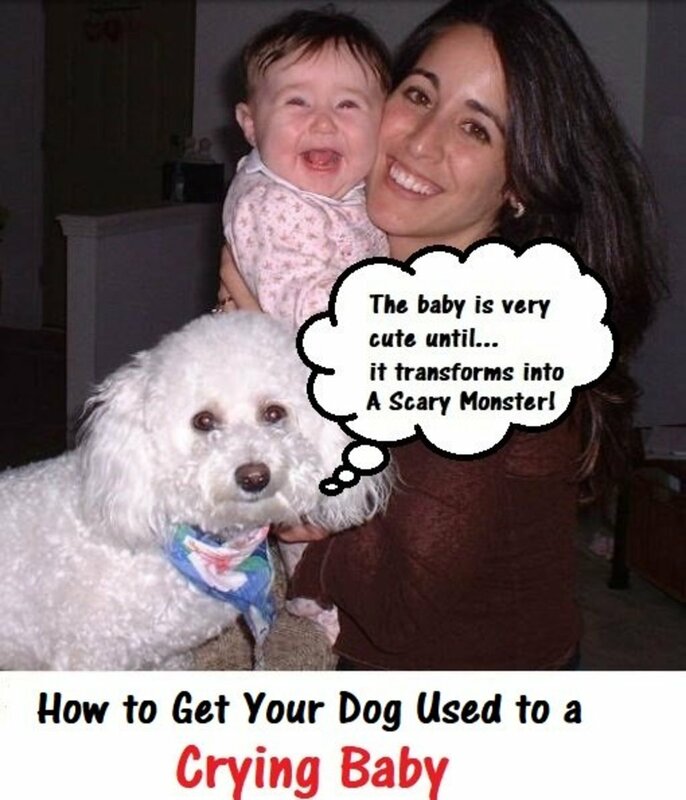 Works great for trick training and it makes dogs extra creative as they will "try" behaviors in hopes of getting it right. You must initially prepare the training area. Keep your dog away for now. In a quiet room (preferably with carpet) without any major distractions going on, place the ramp in the middle of the floor, placing it level. The goal is to present the ramp in a less frightening form at least initially. Without the incline of the ramp, we are looking at a flat surface that is, therefore, less intimidating. Tip: You can present the ramp with several boxes or chairs on both sides, so your dog doesn't feel tempted to step off of it and the day you practice with the ramp inclined, your dog may be less hesitant. Use caution when training your dog to use a ramp and provide him support and assistance as needed to prevent him from jumping off or falling. Arm yourself with your clicker (if you use it) and some bite-sized high-value treats placed inside a treat bag. Hold several of these treats in your hand with your clicker so that you are fast in delivering them. Call your dog into the room and be ready to mark any investigative behaviors. If you are using your clicker, click and treat your dog for looking at the ramp, then walking towards the ramp, then sniffing the ramp. If you are not using a clicker, you can use a verbal marker instead. Simply say "yes!" followed by a treat when your dog looks at the ramp, then walks towards the ramp, then sniffs the ramp. You want to mark your dog for progression, not retrogression. So if your dog was sniffing the ramp and then goes back to just looking at the ramp, don't click: wait it out and see if your dog goes back to sniffing again. If he does, mark that immediately. If your dog loses interest and never goes back to interacting with the ramp, you may need to go back to start and start marking again for just looking at it. You may have to encourage him initially by tossing a treat by the ramp to emphasize that the ramp is what brings good things. Do this no more than a couple of times though, you want your dog to approach the ramp on his own. Increase the criteria. In other words, start asking for more. Now, only click and treat when your dog interacts with the ramp with his paws. Click for stepping on it with one paw, then with two paws and then three paws and then once all four paws are up, reward your dog with a jackpot of treats (several treats given at once) as you praise him lavishly. Let him repeat the behavior several times until he understands that standing on it on all fours is highly rewarding. If your dog is tentative in placing his paws on the ramp, you can encourage this behavior temporarily by tapping on the ramp. Click and reward for one, paw, two paws and then give a jackpot when he's with all fours on it. Increase the criteria. Now, that your dog has figured out that the ramp is a special place to walk on, it's time to put your dog's brain more at work. The goal is to get your dog to walk across the whole ramp. You can use your hand with a treat to lure him across and then feed him the treat once he has made it across. Use the food to guide your dog just a few times. Start to fade the food lure as we don't want the dog to become over-dependent on the sight of the treat. So after using the treat as a lure to get the dog across the ramp perhaps 4-5 times, at some point, pretend to have the treat in your hand, when in reality it is empty. Use your hand to guide him through, then, once your dog has walked across the ramp, click and feed him a treat from your other hand. Once your dog walks across the ramp more and more, start adding your verbal cue. You can say "ramp" or "hop up!" for example. Say it a few seconds before using your hand gesture to encourage him to move forward. In my video, I will be using "ramp" quickly followed by my hand gesture. Do this several times until the behavior becomes fluent and your dog appears to be more confident. 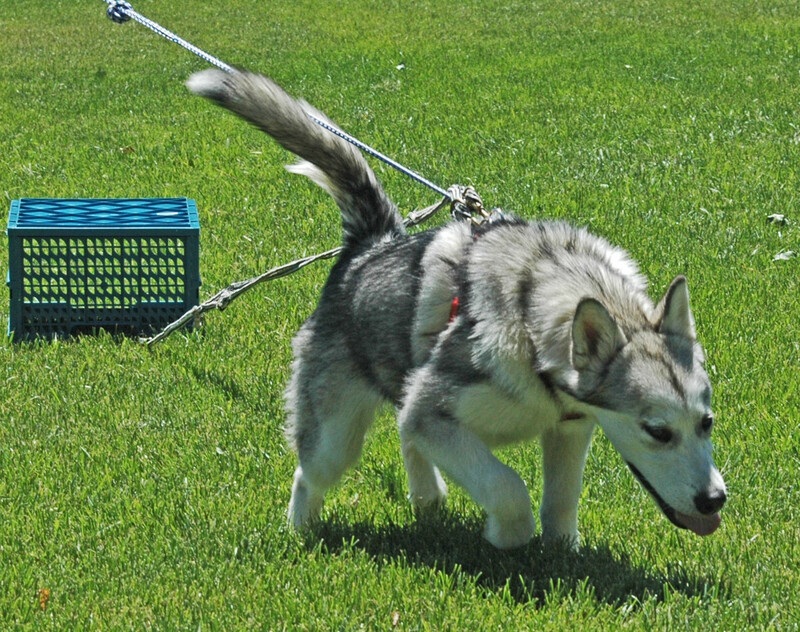 Tip: If feasible, practice the behavior now outdoors, put the ramp on grass and practice him walking on it. This helps to generalize the behavior. 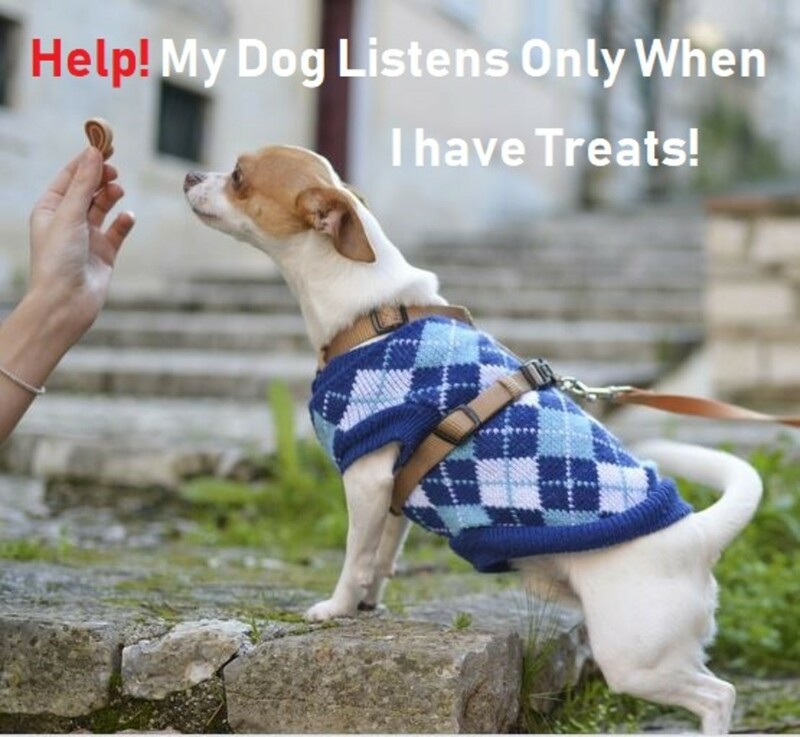 If your dog is too distracted outside, you may need to take a few steps back and use higher value treats to motivate him. You can also take baby steps and move the ramp closer and closer to the outside by placing it by the door that brings him outdoor, then progress to outdoors just next to the door, and then farther and farther perhaps closer to the car or truck. The next step is to add a very slight incline. Increase the incline very, very gradually. You can start with a sidewalk or step. Then, you can further incline by placing the ramp against the couch. 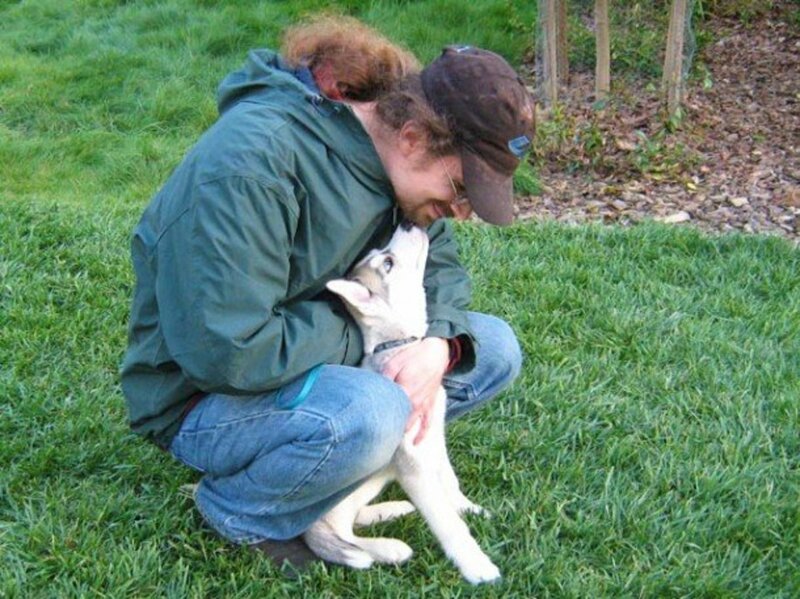 Use your verbal cue followed by your hand gesture to guide him up while a helper gently holds him to prevent him from falling or jumping up for extra security, then, once over the ramp, give a jackpot of treats and encourage him to come down, always with the helper assisting if you are afraid your dog may injure himself. You can also use boxes or chairs to prevent jumping off the ramp or accidentally falling. If your dog is tentative in climbing due to the incline, you may need to take a few steps back and start clicking and rewarding for putting one, paw, then two, then all four and then showing a food lure temporarily again, but fading it again quickly. In my video, I used a food lure (cookie) a couple of times because my dog was a bit hesitant. Then, I only used my empty hand along with my verbal cue "ramp." Practice with the car/truck. Now that your dogs is more confident using the couch, you can start practicing in the same matter using the car or truck. You want to protect all your hard work by preventing anything negative happening at this point, so if you have a helper, have him help assist your dog up if necessary to prevent scary falls. Don't forget to lavishly praise and reward with very tasty treats. If your dog loves car rides take him on for one so to leave a super positive impression on his mind. Don't forget to pat your back as well for a job well done! Look for a ramp with a good gripping surface. This allows your dog more secure footing. Generally, the wider the ramp, the better, as it helps your dog walk with confidence. If you plan on using your ramp at night, you may want to look one with reflective striping. Grooming Difficult Dogs: Sedation or Behavior Modification? Sounds great! Overcoming hesitancy of walking on steps/ramps is also a confidence-building exercise. Hopefully, you have the opportunity to practice when school is out so that there are no distractions! I got it, Adrienne. I will try using a nearby school's stairs for training. Years ago, we had a dog that definitely needed ramp help, but was terrified of it. We tried lots of options and training, only to give up and hoist him into the vehicle. Oh well. Thanks for sharing the tips in case we have another one that needs this assistance! Linda, I am on the same page. I often caught myself holding my breath when my dog jumped in and off the car and after seeing him limping after a recent outing, I knew the ramp was a must from now on. 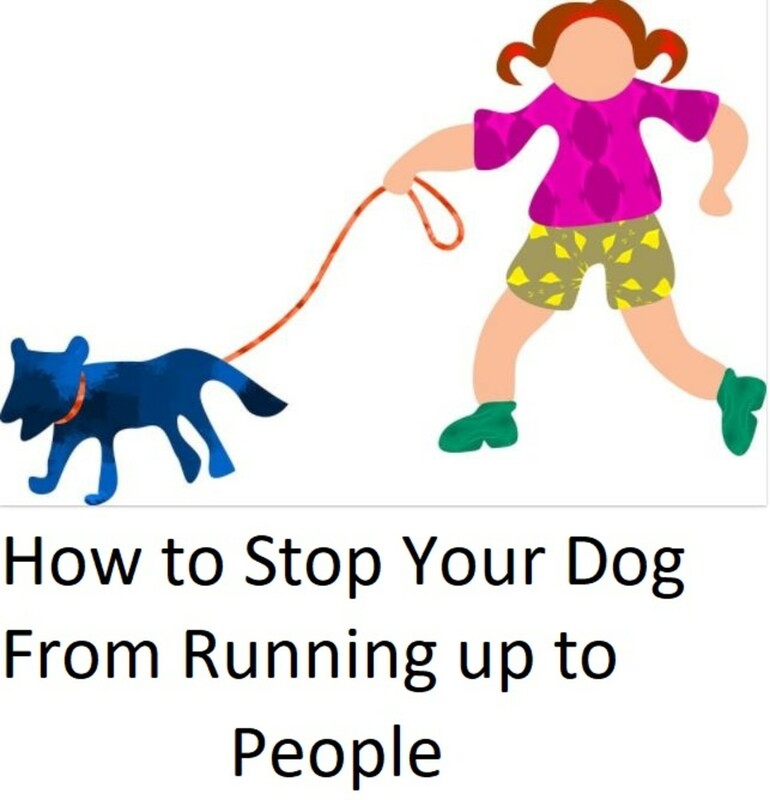 Suhail, it would take a step-by-step approach as outlined in the article of praising and rewarding your dog for interacting with the stairs, looking at them, sniffing them, placing one paw etc..Your case may be a bit more complicated though because you might not have metal stairs at home to practice with in such a gradual approach. You may need super valuable treats and making the proces extra fun and then the rest of the time not interacting with them boring, to emphasize that the stairs are a predictor of good things. I don't know if you have any neighbors who can let you practice on theirs or a place you can go often to and practice often. Many dogs are afraid of the steel stairs due to the noise produced upon walking on them, the feel on their feet and if they are "see-through" they can be intimidating. It takes time to instill confidence, but it's worth it in the long run. Thanks for sharing all of the tips. They sound great. My dog enters our vehicle on a ramp because he started to develop arthritis at quite a young age. I much prefer to see him walking into the vehicle on the ramp than trying to jump into it. My dog is OK with wooden or concrete ramps, but simply refuses to use a metallic one like in the pictures in your article. This seems to cause problems during our long hikes as well, because we have to negotiate steel stairs and metal bridges on the tracks as well. What can I do in a situation like this?